Elizabeth Cheney was born 12 Jan 1643/44 with her twin brother Nathaniel in Newbury, Mass. Her parents were John CHENEY and Martha PARRATT. In her father’s 1666 will, Elizabeth received “three cows, one called “Spark” with her calf, one whitefaced and a third called “Col”, two yearling heifers and £15.” Elizabeth died in 1714. 1667 – The evening of “training day” was often a riotous one for young colonials, and when he was twenty, Stephen Cross and his friends got themselves into serious trouble by wrecking the town’s bridges near the wind-mill. They were jailed, sentenced to sit in the stocks, pay L3 each in fines and be bound to good behavior. 1668 – Stephen was characterized as “a turbulent fellow but (one who) never spoke ill of authority,” the former being obvious and the latter dubious as on this occasion he had been charged with “reproachful speeches against the worshipful magistrates,” saying that they sat at dinner drinking burnt sack and when they came into court they looked red as though they were flustered and acted as though they were “fodeeled.” Again he was bound to good behavior. 1670 – Stephen and Thomas Deblanchet got into a fist fight in the meeting-house at sermon time, and, being summoned to court and not appearing, he was fined for contempt. 1672 – Robert Cross, sr., his son Stephen, widow Cheney of Newbury and her daughter Elizabeth met at the house of Quartermaster John PERKINS in Ipswich. Robert Cross desired the widow to give her daughter Elizabeth to his son Stephen in marriage, but the widow would not consent unless Stephen was given some land to settle on by his father. Cross told the widow that he had an island in Chebacco river which he did intend for Stephen and that he valued it at about L200. This was staisfactory to goodwife Cheney and she consented to the match. Immediately thereupon Robert Cross drew a deed of gift to his son Stephen of the said island and subscribed to it, Perkins and John Kendrick acting as witnesses, and the young people “in some convenient time after were joined together in matrymony.” John Kendrick swore to these facts on March 31, 1685. Possibly Cross’ marriage to Elizabeth Cheney of Newbury at an unknown date was a restraining influence, for his court appearances for violent acts ceased for a time, at least. 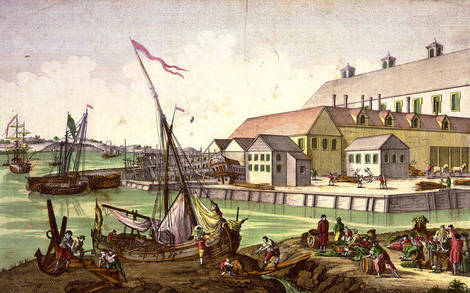 He bought half an acre of land on Water street in Ipswich from John Kendrick and build a house. Thomas Dennis, the talented Ipswich furniture maker, made him a table and chair in 1675. 1672 – Stephen purchased the sloop Adventure. Samuel Cogswell of Ipswich owning a share, and was supposedly made fit to go to sea by Moses Chadwell of Lynn, who did a slow and poor job and lost in the resulting suit in 1676. His business as the captain of a coasting vessel, the sloop Adventure of twenty tons, took him as far afield as Wethersfield in Connecticut and the towns on the Exeter and Piscataqua rivers, the voyages frequently resulting in lawsuits for payment of freight which Cross usually won. 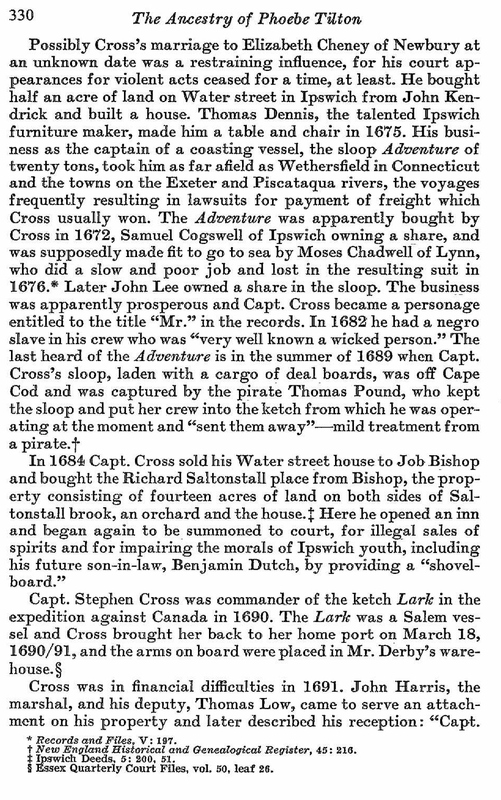 Later John Lee owned a share in the sloop. The business was apparently prosperous and Capt. Cross became a personage entitled to the title “Mr.” in the records. 1690 – Capt. Stephen Cross was a commander of the ketch Lark in the BATTLE OF QUEBEC. The Lark was a Salem vessel and Cross brought her back to her home port on March 18, 1690/91, and the arms on board were placed in Mr. Derby’s warehouse. 1691 – Stephen was in financial difficulties. John Harris, the marshal, and his deputy, Thomas Low, came to serve an attachment on his property and later described his reception: “Capt. Cross tooke his nacked sword and he ran to ye said Low who was to assist me and told him he would run him through.” Having ejected Low, the captain clapped the point of his rapier to the marshal’s breast and bid him get out of the house. He saved his house and land by deeding them to his two minor sons, Stephen and John, who were to take possession when the reached their majorities and divide the property evenly, on May 9, 1691. 1693 – Capt. Stephen Cross, using his father as nominal plaintiff, sued John Burnham, jr., their Chebacco neighbor, in 1693 to recover a lot of marsh, the title to which was in dispute. Cross won a verdict but Burnham appealed the case successfully. There are forty-one papers on file in this appeal, some of the evidence going back to 1663. In one paper Robert Cross entered the date of his marriage and birthdays of his daughters Elizabeth Nelson, Mary Herrick and Martha Dirkye, all of whom testified. The appeal was heard May 21, 1695. 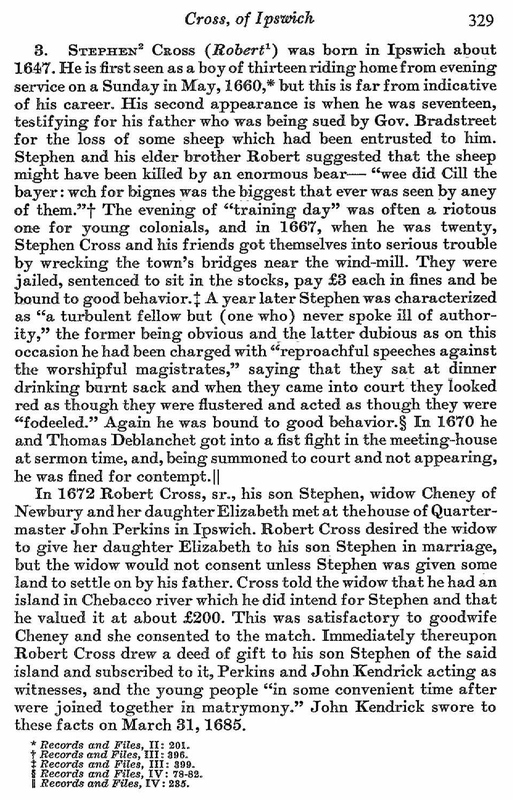 (Supreme Judicial Court, No.3138) Robert and Mary Cross were both living in 1694 when they consented to a sale by Stephen Cross of one-half of the marsh called “Daffeedowndille” on the Chebacco river to Thomas Choate for £40. 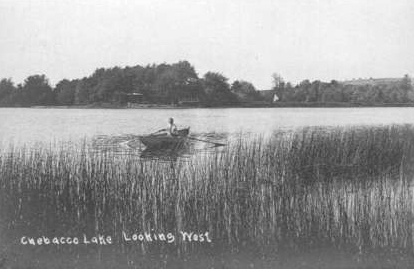 1694 – Stephen began disposing of parts of the paternal farm at Chebacco, although his father was still living on it, selling one-half of “Daffeedowndille” marsh to Thomas Choate for £40 on July 24, and fourteen acres of marsh to John Appleton, jr., on August 10. His brother-in-law, the steady Lieut. William Butler, bought for £100 all of Stephen’s right, title and interest in the estate of Robert Cross, sr., as he disposed of it by deed or gift to his sons Robert Cross, jr., and Stephen Cross, on June 3, 1695. If the old man was still alive, he was safe in Butler’s hands. 29 Aug 1694 – Robert Jr. released to his brother Stephen all of his interest in the paternal farm at Chebacco, Stephen promising to acquit him of all obligations toward their father. There are no probate records for Stephen Cross. 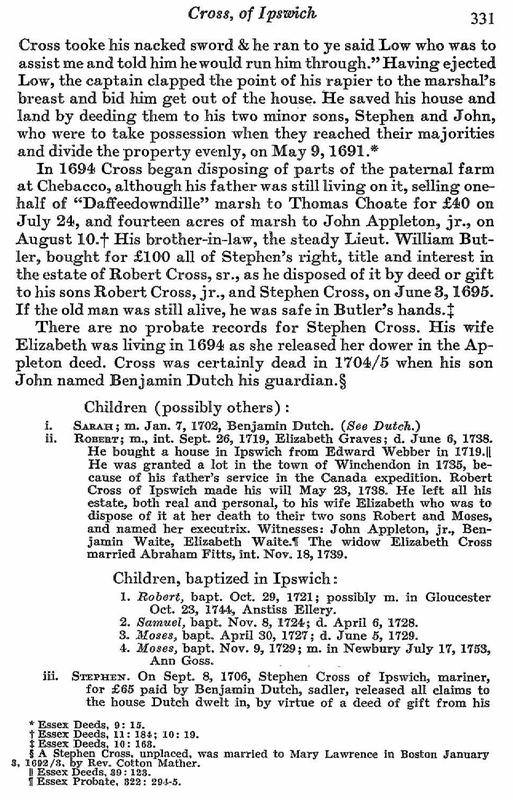 His wife Elizabeth was living in 1694 as she released her dower in the Appleton deed. Cross was certainly dead in 1704/05 when his son John named Benjamin Dutch his guardian. (Note: A Stephen Cross, unplaced, was married to Mary Lawrence in Boston January 3, 1692/3, by Rev. Cotton Mather and on 12 Feb. 1713 – Sarah Cross, widow, was appointed administrator of the estate of her husband Stephen Cross, late of Boston, mariner, Joseph Jackson, cooper, and Elizabeth Jackson, spinster, being her sureties. This may well have been the Ipswich man. 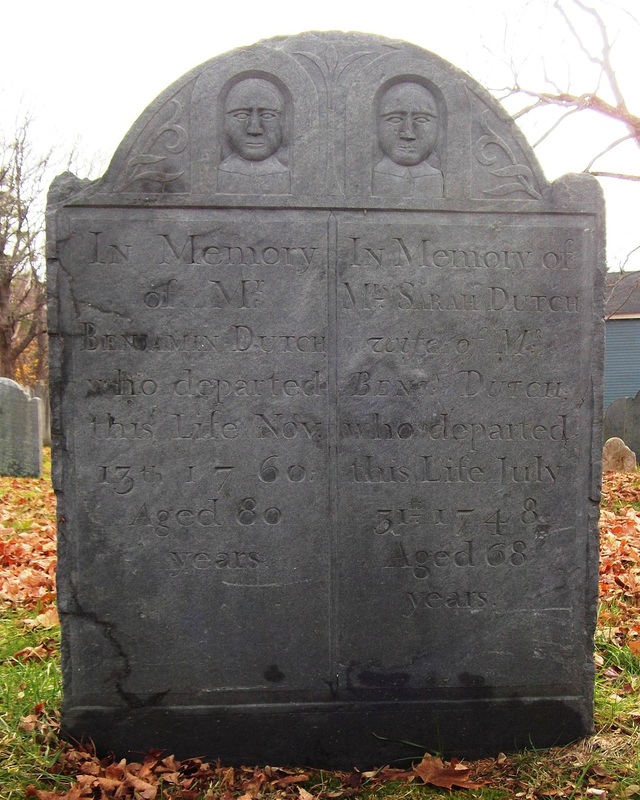 Sarah’s husband Benjamin Dutch was born 9 Aug 1680 in Ipswich, Mass. His parents were John Dutch and Elizabeth Roper. 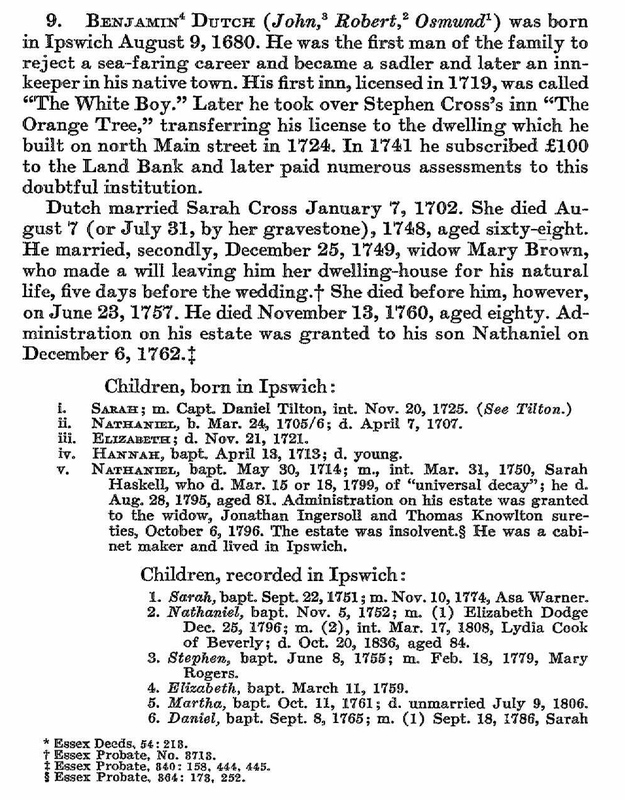 After Sarah died, he married 25 Dec 1749 to widow Mary Brown. Benjamin died 13 Nov 1760. Sarah Cross Dutch Gravestone -- Highland Cemetery, Ipswich, Essex, Mass. 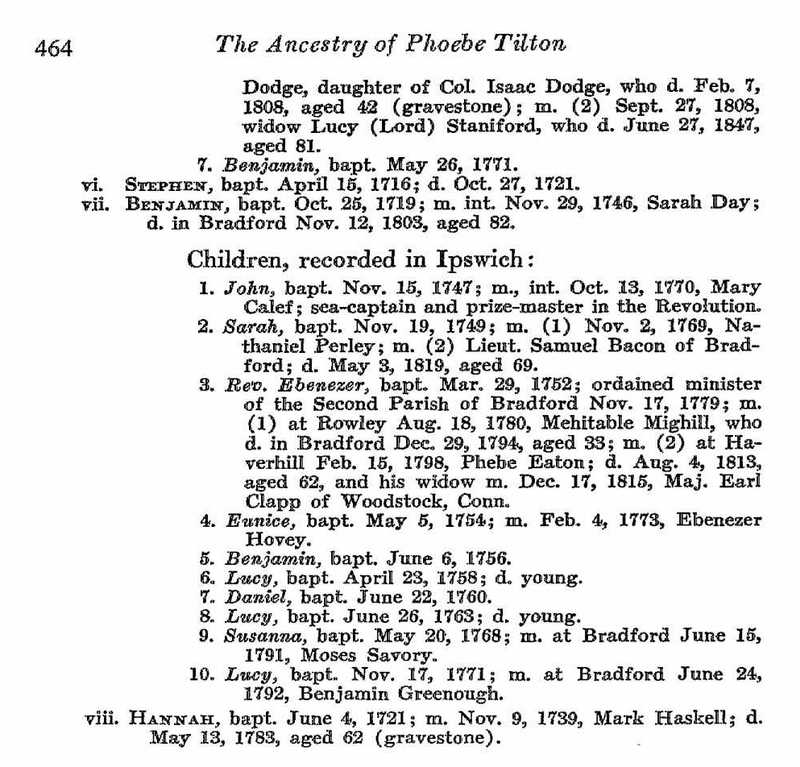 Stephen’s wife Sarah Jackson was born about 1684 – Essex, Mass. Sarah died 7 Aug 1748 – Ipswich, Essex, Mass. 8 Sep 1706 – Stephen Cross Jr of Ipswich, mariner, for £65 paid by his brother-in-law Benjamin Dutch, sadler, released all claims to the house Dutch dwelt in, by virtue of a deed of gift from his father Stephen Cross, last of Ipswich, bearing date of May 13, 1691. 12 Feb 1713 – Sarah Cross, widow, was appointed administrator of the estate of her husband Stephen Cross, late of Boston, mariner, Joseph Jackson, cooper, and Elizabeth Jackson, spinster, being her sureties. This may well have been the Ipswich man. 22 Jan 1705/06 – John Cross, a minor seventeen yeas of age, son of Capt. Stephen Cross, late of Ipswich, had his beloved brother-in-law Benjamin Dutch, sadler, appointed his guardian. Anna’s husband Joseph Hart was born about 1686 in Essex, Mass. They had a son Stephen Hart. This entry was posted in 11th Generation, Line - Shaw, Place Names, Sea Captain, Tavern Keeper, Veteran and tagged Battle of Quebec 1690, Ipswich, Pirate Adventure, Slave Owner, The Adventure, The Lark, The Orange Tree Inn. Bookmark the permalink. Hi – I am a descendant of Stephen Cross and would love to hear from you. I see that this posting is from Dec. 2011 but if you are still available, contact me at hikat5@msn.com. 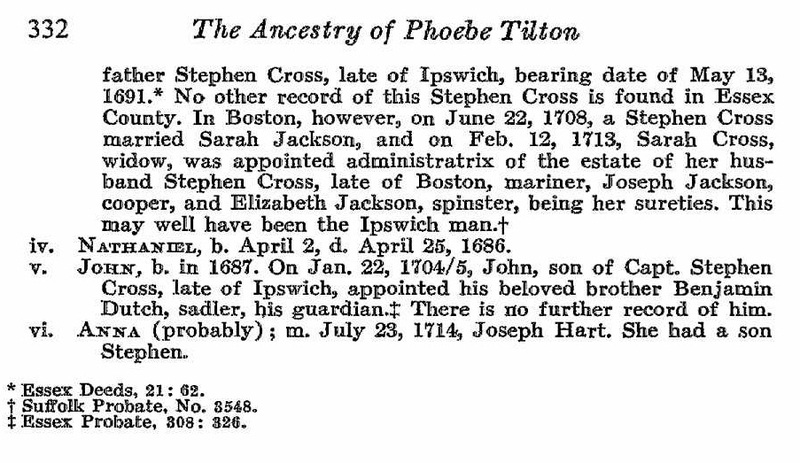 I am hoping to take a trip to Massachusetts maybe in the fall to do some genealogy research on the Cross family. My grandfather was a Cross. I sent you an email, I would be happy to hear from you, I worked in the shipping industry for many years so I particularly enjoy learning about ancestors who owned ships. Greetings. Looks like you get sporadic comments, I hope you are still available. I am a Cross descendant from upstate NY and was looking at the posts regarding Robert Cross crossing from England in 1634 on the John and Mary. I don’t see his name on the passenger list and am wondering if you have other documentation on that? There is a genealogy.com user “Prudy A. Weil” that has this same information. I’m going to see if I can contact her as well. Just trying to dot the i’s! I’m reachable at sherrera@mac.com. I appreciate all the work you’ve done on this! FYI regarding Prudy A. Weil’s documentation. I attempted to contact her. The email address is no longer in use.